Tadeu de Lima Oliveira, J., Helena Garófalo Chaves, L., Amilton Santos Júnior, J., Honório Guedes Filho, D., Batista Campos, V. (2012). Response of Sunflower to Nitrogen Application and Water in Northern Brazil Alfisol. 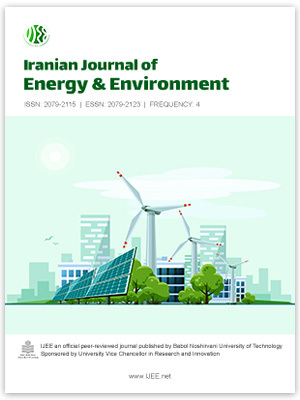 Iranian Journal of Energy and Environment; previously called: Iranica Journal of Energy & Environment, 3(3), -. João Tadeu de Lima Oliveira; Lucia Helena Garófalo Chaves; José Amilton Santos Júnior; Doroteu Honório Guedes Filho; Vinícius Batista Campos. "Response of Sunflower to Nitrogen Application and Water in Northern Brazil Alfisol". Iranian Journal of Energy and Environment; previously called: Iranica Journal of Energy & Environment, 3, 3, 2012, -. Tadeu de Lima Oliveira, J., Helena Garófalo Chaves, L., Amilton Santos Júnior, J., Honório Guedes Filho, D., Batista Campos, V. (2012). 'Response of Sunflower to Nitrogen Application and Water in Northern Brazil Alfisol', Iranian Journal of Energy and Environment; previously called: Iranica Journal of Energy & Environment, 3(3), pp. -. Tadeu de Lima Oliveira, J., Helena Garófalo Chaves, L., Amilton Santos Júnior, J., Honório Guedes Filho, D., Batista Campos, V. Response of Sunflower to Nitrogen Application and Water in Northern Brazil Alfisol. Iranian Journal of Energy and Environment; previously called: Iranica Journal of Energy & Environment, 2012; 3(3): -.